Ryan Lawmaire IV w/ 4 HP Honda Engine (1 Weight); 21,000 Sq. Ft/Hr. 38" W x 48" L x 38" H; Wt: 270 lbs; Aerating Depth: 2 3/4"
29.5"x48"(40 Closed)x51"(28 Closed); 288 lbs; Aerating Depth up to 3"
57"L x 29"W x 52.5"H; Wt. : 242 lbs. 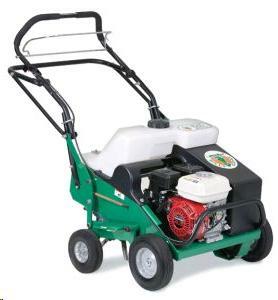 ; Aerating Depth: 2 3/4"
* Please call us with any questions about our aerator gas rentals in Sacramento and Citrus Heights, serving Auburn, Placerville, Woodland, Davis, and Elk Grove in the Sacramento area.